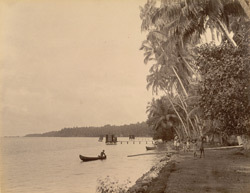 Photograph taken about 1900 by the Government photographer, Zacharias D'Cruz of a view on the seashore at Bolghatty, near Ernakulam in the erstwhile Cochin State. It is one of 76 prints in an album entitled 'Album of South Indian Views' of the Curzon Collection. George Nathaniel Curzon was Under Secretary of State at the Foreign Office between 1895-98 and Viceroy of India between 1898-1905. A large number of little islands that dot the backwaters lends a scenic charm to the waterfront in Ernakulam. Just across the north western end of the promenade is the Bolghatty Palace of Ponjikkara island, the former residence of the Political Agents of the British regime. The palace has now been converted into a hotel.